5 19 Be the first to write a review! Includes 14 ft. power cord. 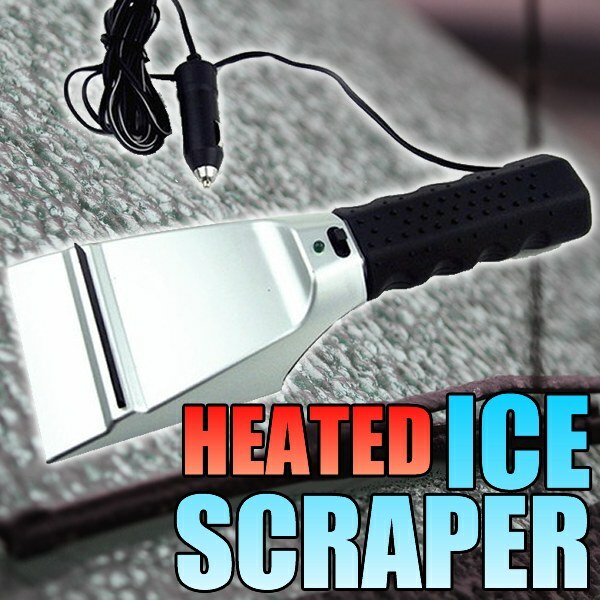 This 12V Heated Ice Scraper is the faster and easier way to remove dangerous ice from your vehicle windows. The built-in heating element works from your cars electrical system - just plug it into any 12V outlet! Tough ABS construction won&apos;t scratch windows; attached rubber squeegee clears away melted ice Wide rubber handle with raised grip-nodules for firm hold even with heavy mittens. On/off switch with LED power-on indicator light, circuit breaker fuse. Includes 14 ft. cord to reach windshield and all windows. Trying to chip ice from your car windows can be dangerous, so here&apos;s a better way... melt it off! Makes a unique and thoughtful gift. Dimensions: scraper length 12", width 3-3/4" (stores in glove box or console).